Shopping for Air Hogs Remote and Radio Control Toys? Be the eye in the sky! 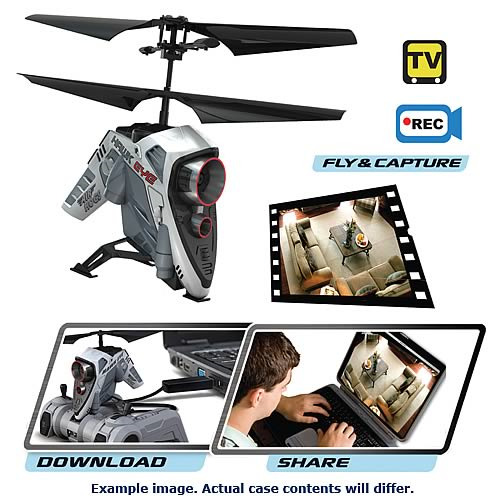 Spy on unsuspecting people with this Air Hogs Hawk Eye RC Helicopter! It's easy to upload and share your videos and pictures. Case includes 2 Air Hogs Hawk Eye Camera Copters. Capture fun moments from overhead with the amazing capabilities of the Air Hogs Hawk Eye Camera Copter. With the ability to take up to 5 minutes of video or hundreds of photos, you'll never miss out on memorable moments again! Surprise your friends and family with a candid shot as you expertly maneuver the Hawk Eye into position. The Hawk Eye RC Helicopter stands about 4 3/4-inches tall and includes a controller-charger, USB cord, and instruction sheet. Requires 3x "AAA" batteries, not included. Ages 12 and up. The Hawk Eye is equipped with steady-fly technology so the copter can automatically correct itself in unstable situations. When you've finished flying, it's easy to upload and share your photos and videos with friends online. Free downloadable software from the Air Hogs website allows you to mash your videos and pictures together, edit the length, and add cool images and sounds to videos. As you transfer photos and videos to your MAC or PC via the USB cord, your Hawk Eye will automatically recharge so you're always ready for the next flight! This case contains 2 individually packaged Air Hogs Hawk Eye RC Helicopters. Assortment unspecified/random at this time.